This is the 3rd in a series of e-alerts from the 2014 American Academy of Environmental Medicine Advanced Seminars. Dr. Mary Ann Block presented a very interesting lecture on Magnesium. It is a co-factor in over 300 metabolic reactions which explains why it is so important. Sixty-eight percent of people are deficient. Treatment is simple. Take care to avoid the above five listed causes and supplement your existing diet with magnesium-rich foods and supplements. Some foods that are rich in magnesium include green leafy vegetables, nuts, legumes, and unrefined grains. On the other hand, meats, fruits, and dairy have very little magnesium. We have given patients with severe acute migraine headaches an intravenous push of magnesium with Vitamin B6 with very dramatic results. We have done the same thing with acute muscle spasms and pain. This has worked so well that we are now using a transdermal cream which you apply to the painful muscle area. Be sure you are not one of the 68% of people with magnesium deficiency. Magnesium Citrate is one of the best supplements available for this mineral. 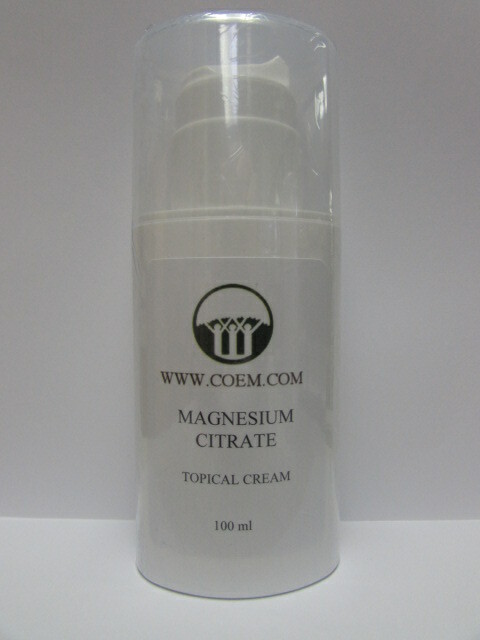 Magnesium Citrate (150 mg, 90 capsules) is available at COEM for $12.00 per bottle, while our Magnesium Citrate cream (4 oz pump) is $31.00. To order a supply of magnesium citrate, or any other supplements from COEM, send an e-mail to ORDERS@COEM.COM with the following information. Please allow 5-7 business days to process your order. For more information on the Center for Occupational & Environmental Medicine, visit www.coem.com or call us to setup an appointment at (843) 572-1600.